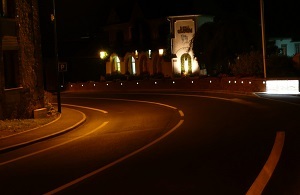 Objective : Mark out the bend so energy-consuming lights can be removed. Blue SIGNALIGHT studs installed on the top of the barriers. Some bends along the road network are dangerous due to their layout and approach speeds. 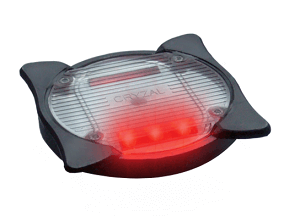 Despite being clearly visible during the day, at night they represent a danger to drivers. By equipping the central divider, the danger of a head-on impact can be eliminated. By equipping the shoulders, whether metal, wood or reinforced concrete barriers, much of the risk of leaving the road is removed. Here, light marking is installed with studs along the centreline. 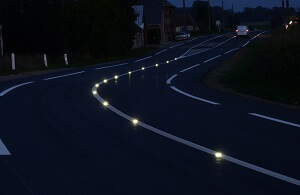 Spacing can be the same as module 13 for road marking, with studs installed every 6.5m or 13m maximum. In that configuration, the studs need to be on in continuous mode. If they are only needed at night, studs with inbuilt solar panels are sufficient. If they are needed both day and night, wired High Power LED studs must be used. They are powered by 220V AC mains power. – or on top of it. This product reduces the cost of covering the entire bend. This type of equipment can be powered by a set of solar panels if the studs installed operate in synchronised flash mode. 1. 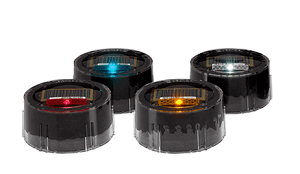 For night-time operation, we recommend installing SOLARLITE or ECOLIGHT 60 studs. The choice will depend on traffic volumes and sunshine levels. 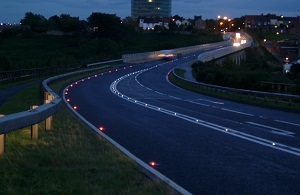 SOLARLITE studs are currently in use along various motorways in Britain: along centrelines and shoulders in continuous nighttime mode. They have good resistance to traffic and great charging qualities. 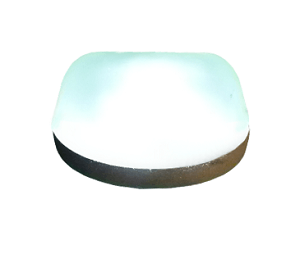 can be varied according to the ambient light level. Here, night-time visibility is the priority. In this case, we recommend installing SIGNALIGHT studs. 1. 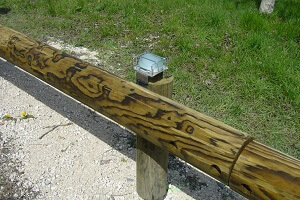 Mounting on the top for wood, metal and reinforced concrete barriers. 2. Mounting on the side for reinforced concrete shoulder barriers.